Hello, I'm Gregor and I put this site together. 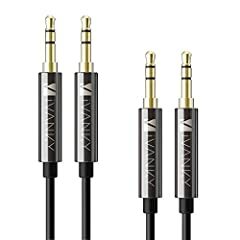 At first, you'll find an overview of recommended aux cables, followed by a public poll and a general buying guide on aux cable. Further down on this page, we do link to other well-written articles and reviews about aux cables. At last, you'll be able to weight in your own opinion in the comments section. If you also want to vote on the best aux cable, click here to view the poll. 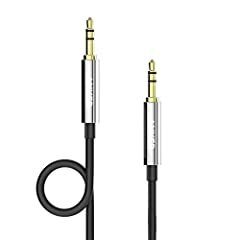 Used for listening to anything from music to a voice recording, aux cables come in a variety of sizes and shapes. 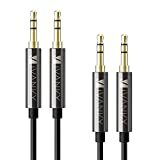 AUX cables, auxiliary cables, are audio cables that are inserted into inputs on devices such as speakers, radios, headphones, and more. Today, they are mostly used for playing music, audiobooks, navigation, and phone calls. However, not all AUX cables are the same, and buying the wrong cable can waste time and money. 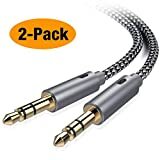 This simple guide below described the different audio cables, what they are used for, and what factors to think about when getting a new one. There are two main types of AUX inputs, where the cable is plugged in. One type is the 3.5mm input, the most popular and common type used today. 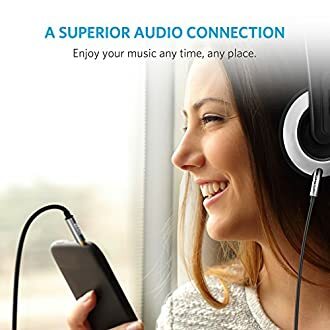 They are more commonly known as a normal headphone socket and are located on almost any mobile device, computer, and even in cars. Most have the 'AUX' label right beside the input, but some are labeled 'AUX-IN' or 'Line In'. A device with a 3.5mm input will require a cable of the same size. The other type is the RCA audio patch cables. Used since the 1960's for video games, the RCA AUX cable inputs are more commonly found inside Renaults, Peugeots, and Citroens cars. They are made with two connectors with plastic rings, one red and one white, usually. The separate connectors are each for the different stereo channel, left and right. Optical digital connectors, aka Toslink, are used for various things such as connecting a TV, CD player, and/or a network music player to an audio receiver or integrated amp. Coaxial digital cables work much like Toslink cables, and they can use RCA connectors. XLR audio patch cables are used with high-performance gear including but not limited to subwoofers, power amplifiers, DACs, and SACD players. Earlier, it was explained the different types of AUX cables there are. However, regardless of the types, some come in specialized sizes and will not be compatible with all inputs. 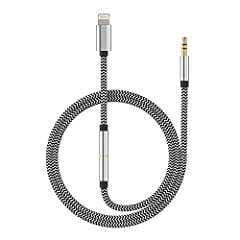 The 3.5mm cable, for example, cannot be compatible with a 3mm input. Therefore, it is necessary to not only check the cable size/type but the input size as well. Otherwise, the cable will not be compatible. This means that the jack of the cable will not fit into the input, there will be poor sound quality, or no sound whatsoever. Nearly every cable uses copper wiring. However, not every kind of copper is the same. Some of the wirings are made with cheaper compounds, which causes it to get heated more likely. The hotter the cable, the easier it is for the cable to catch fire, which is the worst case scenario. Those with higher quality compounds stay cooler, regardless of how often they are used. This allows for a safer and longer use. Some packaging does not state the compound quality. If this is the case, the next option is to look up online for the quality and read product reviews. The outside of the chord can be just as important as the inside. Rubber covers and cloth braided covers are the more used materials. Some, not many, are made of a kevlar material. There are different opinions about the different materials. There is one thing they all have in common: if the material is too thin, the cable will be easily damaged. 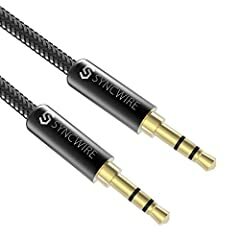 Looking up reviews on the cables would be best for determining if the cable is strong enough since most products don't advertise the cover's thickness. Beyond that, personal preference is the only thing that determines which cable should be purchased when regarding the cover's materials. 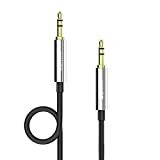 The jack of an AUX cable is the part that connects the cable and the audio input. The best quality jack is gold plated. The reason for this is because gold is the best conductor for electric currents, allowing for better quality audio. 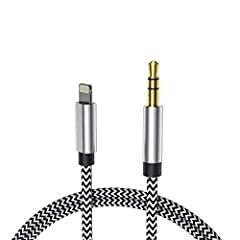 The plating is very thin, so the price of the AUX cable shouldn't be higher. If it is, it is only slightly. 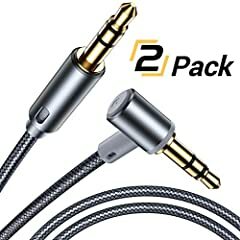 Most of the highest rated AUX cables have gold plated jacks. Depending on what the cable is being used for, the length is very important. The average length of an AUX cable is anywhere from three to ten or more feet long. 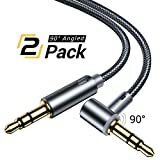 Smaller sizes between three and five feet are optimal for headphone use, or short-length connections. Any cables longer than five feet are more appropriate for long distance connections. As the higher quality cables can be high up in cost, some come with a warranty. However, many do not come with a warranty. Those that do usually last for up to 2 years. Some companies even have a 24/7 customer service devoted to the AUX cables. If getting a product that is higher up in price, it is recommended to find products that come with a warranty, even if it costs slightly more. The reason being is that the store the product was bought from might not refund a faulty cable. They also, usually, have a one-month policy, sometimes slightly longer. This means if the product becomes faulty after a month, there is no way to replace the product. It is quite common for an AUX cable be bent. Bending an AUX cable can gradually and/or suddenly weaken the inner copper wirings, weakening the cable and shortening its lifespan. Some AUX cables advertise the 'bend life'. The bend life of an AUX cable means how many times it can be bent as well as how many times it can be plugged in and unplugged. The average bend life of a high-quality AUX cable should be at least 10,000 bends. Some even go as high as 15,000 and higher. Generally, the higher the bend life, the longer the product will last, though other factors must be considered as well. New: Our editorial list of additional articles. 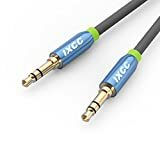 We decided to gather informartion all around the internet and present you a list of helpful, external links to interesting reads about the best aux cables and their reviews and guides. 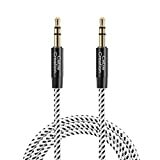 Griffin Aux Audio Cable 3011-AUXCBL review | What Hi-Fi? 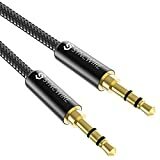 You're not convinced by the previous writings about aux cables? Of course you can just choose by visual impression, that's why we present you all our chosen products at a single glance. A click on any image is enough to open an external link to the best offer we could find. Finally, we want to present you our rating criteria for our aux cable comparison, so you can better understand and comprehend our recommendations and the rating process itself. Furthermore, we still ask you to keep your eyes open for short term deals in order to make some great bargains with aux cable in 2019. Published by G. Krambs on StrawPoll.com (last update on 2019-04-18 08:17:56). 8 of 12 readers found this article helpful.